Add anchors to your newsletters to make them more easily navigable. An anchor is simply a link within an email and works great for longer newsletters that cover multiple topics. 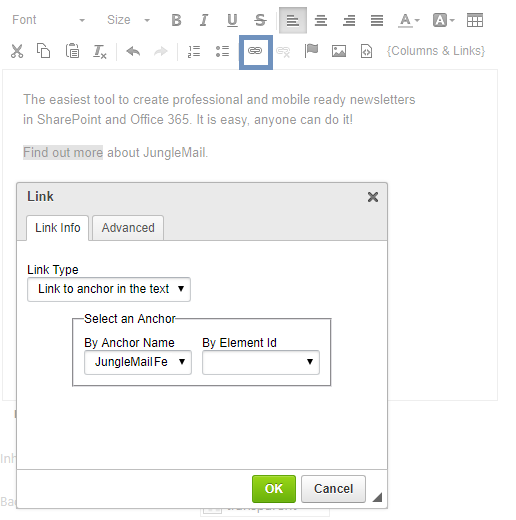 In this tutorial, you will learn how to add anchors to the newsletters you create with JungleMail for Office 365. 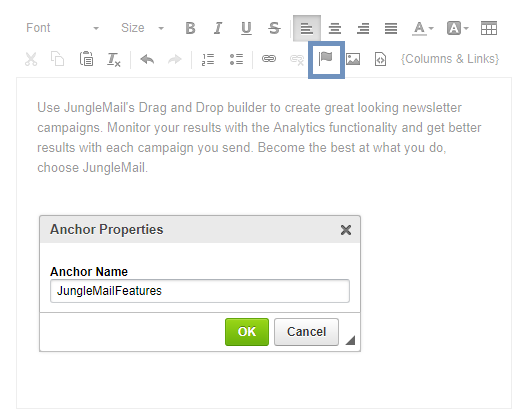 To begin, open your newsletter template in JungleMail 365. 1. Now move to the text block that you want to use as an anchor. Click the flag Icon, insert a name for your anchor and click OK.
3. For link details, select Link to anchor in text and select the anchor you just created. Note: some email clients do not support anchors, so some of your users may not be able to use the anchor links within your emails.